This year’s postseason was littered with hard-throwing starters and relievers. It seemed like bullpens were trotting out hard-throwing reliever after hard-throwing reliever, and if you’re at all active on Twitter, you might’ve noticed a few conversations taking place among certain big-leaguers. Prominent among them was Brandon McCarthy, who noted a few times that the landscape didn’t used to look like this, even just a few years ago. The feeling now is that every team has a handful of flamethrowers. The feeling used to be that a flamethrower was something special, something extraordinary to be cherished. The feeling, basically, is that yesterday’s 92 is today’s 96. The trend is right there, staring you in the face, especially in the case of relievers. In 2007, 13 different relievers averaged at least 95 with the fastball. This past season, the total was all the way up to 46. Also, nine starters averaged at least 95, coming close to the 2007 number for arms in the bullpen. There are indeed more hard throwers, presumably than ever before. League-average velocities are rising. Compared to 2007, there are three times as many guys reaching 95 and above, so a hard fastball isn’t what a hard fastball used to be, in the same way that a dollar isn’t what a dollar used to be. Except that a hard fastball is still just as hard, and tricky to hit. It isn’t simply that there are more young pitchers in the game, now. Velocity starts to decrease from a young age, so a sensible theory would be that the game today is just younger than it was. But the young pitchers themselves are throwing harder as a group. 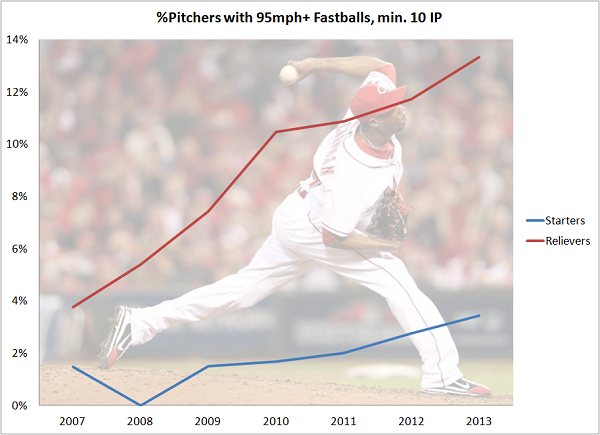 For pitchers 25 and younger, they averaged 90.8 with their fastballs in 2007. In 2013, they averaged 92.5. In between, the number was steadily rising. And in 2007, young pitchers actually threw more innings than they did this past year. Velocity’s up for young pitchers, it’s up for medium pitchers, and it’s up for old pitchers. Velocity’s just up, for all pitchers and all pitches. Starters are left out because of the limited sample sizes. Even within the reliever group, you can see slight gains in strikeouts, suggesting other stuff is also amiss. Many people have pointed to the fact that the strike zone keeps getting bigger and bigger, and I buy into that theory. The numbers don’t lie, and more strikes means more effective pitching. Strikeout rates are up due to some combination of a bigger zone and pitchers throwing harder, and assuredly other things. That has also been examined. What ought to be examined more is where these hard throwers are coming from. Some people have long been aware that average velocities are on the rise, but few have paused to consider how startling that is, given how quickly this has happened. I’ll repeat: there are three times as many hard throwers now as there were just six or seven years ago. Trends in baseball don’t happen that fast, and it’s not like teams are more selective for pitchers who throw hard. People in the game have always valued heat, probably too much. Hard throwers have always gotten priority. Now there are a lot more of them, on just about every staff. Part of the explanation, I imagine, has to do with improvements in weight training and workout regimens, all the way down to high school and below. Maybe there’s greater understanding now of pitching mechanics. And an element is probably improvements in keeping professional pitchers healthy. It could be that hard throwers were always present in great numbers, but they used to get hurt more. At least, that could be a part of it. Never bet against progress when you’re dealing with such a profitable industry. But there are trends, and there are trends over just a few years. You’d expect baseball players to keep getting better and better. You’d expect that process to be gradual, and the trend with hard throwers has been anything but. Between 2002-2007, not a whole lot of anything happened. Since 2007, hard throwers are on the rise, and if this trend continues, then come 2020 a quarter of all relievers will be averaging 95 miles per hour with their heat. I don’t know if it’s fair to expect the trend to continue, but to answer that we need to understand the trend in the first place. The trend is what’s so interesting and what’s so mysterious. Here’s baseball. POW! Here’s baseball, better. This is remarkable and significant and beyond my present understanding. Something is causing this. Something or somethings. And what we observe is an unusually rapid change within a population. This is happening, and it’s happening faster than you might’ve thought. We hoped you liked reading The Most Startling Trend in Baseball by Jeff Sullivan! Why Do We Use MPH? Meeting the dreaded Tommy John at 16? Tommy John surgery is becoming more and more common among high schoolers because of the rapid increase in velocity. Have fun supporting that with any evidence whatsoever. You’re taking an average over all pitchers who are still able to pitch. Tommy John takes pitchers who cannot pitch because of a torn UCL and turns them into pitchers who can pitch. There are two ways for Tommy John surgery to increase average pitcher velocity. One is for Tommy John surgery to increase the velocity of pitchers who have had Tommy John surgery. The other is for harder-throwing pitchers to need Tommy John surgery more often, thus increasing the population of hard-throwing pitchers. TJ must have something to do with it, but I don’t think it is the results of the surgery (or rehab) thaat increases velocity. High velocity pitchers used to get hurt and not be able to come back. Now with TJ, the majority of them come back. I think I heard on TV during the playoffs that 1/3 of all pitchers in the majors had TJ at some point? That seems too high, but even so if TJ did not exist imagine how much worse the pool of pitchers would be. Either way, TJ has been around for a while and I’m not so sure the surgery or success rates vastly improved in 2007 such that there should be a strong league-wide increase in velocity thereafter. Bleacher report put together a list of players undergoing tommy john by year (see link below), which demonstrates the trend well. The number of pitchers undergoing the surgery has skyrocketed. As Boston Phan suggested, the total number of flamethrowers born and the number of flamethrowers who maintain their health and ability long enough to reach the major leagues are not the same. A spike in tommy john surgeries might be bringing these two numbers closer together, and likely explains at least a portion of the effect Jeff is seeing. I’m not sure it is “dreaded” today. Surgeons are very good and have made major advances in this in the last 5 years. Many guys come back stronger. Having talked to numerous college pitcher that have had it, are facing it, or are healthy, the general thought is get it done now and get it out of the way; its only a matter of time and it makes the elbow ligament stronger. A reconstructed elbow ligament will not be stronger. Daniel Hudson would like a word. Also, if you have TJ very early, you’re that much more likely to require a second replacement ligament during your career, and the prognosis for that is significantly worse than the first time round.